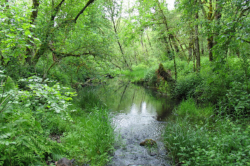 First inhabited by the Kalapooya and Mollala people, Lowell was a lush river gorge. Pioneer Amos Hyland settled here in 1874 and the first post office opened in 1880. Amos operated a ferry service across the Middle Fork of the Willamette River until the Lowell Covered Bridge was built in 1907. The bridge was rebuilt in 1953 after severe truck damage. Because of the many tributaries and creeks in the vicinity, covered bridges were built to connect communities. There are still four preserved historic bridges around Lowell. Lowell was incorporated in 1954. In 1948, the railroad was moved to the south side of the river and the communities of Eula, Landax, Lawler, Signal, Reserve and Carter were dismantled to make way for the Lookout Point Reservoir. In preparation for the Dexter Reservoir damming, the Lowell Covered Bridge was raised six feet to accommodate the predicted higher water levels. In 1954, the United states Army Corps of Engineers finished building Dexter and Lookout Point dams, changing the contours of the river valley. In 1966, Fall Creek Reservoir was constructed. 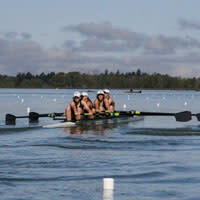 With a permanent regatta course, Dexter Reservoir is one of the best lakes in the region for rowing competitions, drawing teams from across the west coast. The Oregon Association of Rowers, South Eugene High School Crew and the University of Oregon share docks and boathouses on the shores of Lowell State Park. 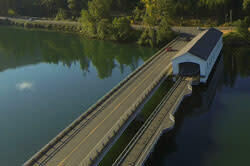 The annual Covered Bridge Regatta is held here each spring. Drag boat races and dragon boat regattas also grace these ideal waters. Recognizable from the movie "Animal House," the Dexter Lake Club was where Otis Day and the Knights sang "Shama Lama Ding Dong." The 2,464-square-foot diner was built in 1949, passing through several owners since the 1978 film. However, with live music and BBQ, the neon-lit diner still attracts movie fans. 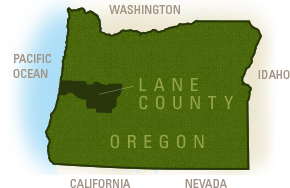 Settled by Elijah Bristow in 1846, Pleasant Hill is a primarily rural community along Highway 58 between Eugene and Lowell. Ken Kesey, author of "One Flew Over the Cuckoo&apos;s Nest" lived here during his adult years (he was raised in Springfield). In 1964, Pleasant Hill High School was outfitted with an experimental rubber-asphalt track attracting University of Oregon runners under Bill Bowerman to train here. Today, Pleasant Hill is a great road trip stop for groceries, camping supplies and discs for disc golf.